Laughing Fridge Art Magnets: It's That Time of Year Again! 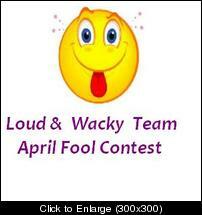 Yes, it's time for the annual April Fool Wacky Giveaway sponsored by Etsy's Loud and Wacky Street Team (LAWST). All you have to do is visit some cool shops and find the fool! You could win a great sample swag bag filled with goodies and coupons and free stuff! Plus you'll find some fun new Etsy shops! Click HERE and you'll be taken to the LAWST blog where you will find the rules and can enter the contest. Good luck and most of all, HAVE FUN and BE WACKY! Me is going to go enter! Thanks for letting me know Donna! PS - Bob is beautiful!! Thanks Penelope and good luck! Yes, Bob is quite the handsome boy, and very lovable!